Wired subwoofer delivers vibrant bass. Sound Connect lets you wirelessly connect to your compatible Samsung TV. Bluetooth enabled for one-touch power on and audio streaming. Samsung Audio Remote app for mobile control. Compact 2.1-channel system with 120 watts of total power. 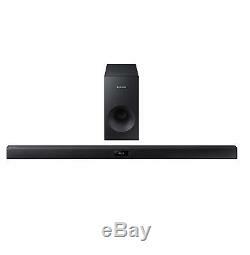 Samsung HW-J355 Soundbar with Subwoofer. The Samsung HW-J355 Soundbar with Subwoofer offers the convenience of Bluetooth and a wired subwoofer for rich, dynamic bass. Wirelessly connect the Soundbar to your compatible Samsung TV with TV Sound Connect, and with your Bluetooth-compatible device, power on the Soundbar and stream music from your smartphone, tablet, or computer. You can even control the settings of your Soundbar on your mobile device with the Samsung Audio Remote app. What's in the Box? Hear and Feel the Bass from the Wired Subwoofer. With a wired subwoofer and built-in woofers, the Samsung HW-J355 delivers rich bass to enhance your movies and shows. Deep lows from the subwoofer and crisp, balanced audio from the Soundbar combine to create a dynamic home theater experience from this compact 2.1-channel system. Connect Wirelessly to Your Samsung TV. Keep your home entertainment system free of cord and wire clutter thanks to TV Sound Connect, which wirelessly connects the Soundbar to your compatible 2013, 2014, or 2015 Samsung 3D TV. Simply pair the Samsung HW-J355 Soundbar with your TV via Sound Connect and start enjoying clearer, richer sound in movies, music, and TV shows. Power On and Control the Soundbar via Bluetooth. The Samsung HW-J355 Soundbar can be powered on wirelessly by any of your Bluetooth-enabled devices. Once on and connected to your device, the Soundbar can be used to wirelessly stream audio from smartphones, tablets, and computers in addition to being used with your television. Control Your System with the Samsung Audio Remote App. Available for compatible Android devices, the Samsung Audio Remote app lets you control your home entertainment system from your smartphone or tablet. Manage the Soundbar's controls, adjust equalizer settings, make music playlists, and more. Experience 120 Watts of Vibrant Audio. The Samsung HW-J355 features 120 watts of total power, with 60 watts being sent to the subwoofer and 60 watts to the Soundbar. The result is rich and dynamic sound for your home theater system. This system supports AV decoding for MP3, WMA, AAC, OGG, FLAC, and WAV formats. The Soundbar includes inputs for optical, USB, and AUX cables. APO/FPO, Virgin Islands, Guam and All Other U. The item must be in BRAND NEW Condition. Screws, bass knobs, plastic coverings, protective films, etc. The item "SAMSUNG HW-J355 2.1 CHANNEL 120 WATT WIRED USB BLUETOOTH HOME TV AUDIO SOUNDBAR" is in sale since Monday, April 27, 2015. This item is in the category "Consumer Electronics\TV, Video & Home Audio\Home Audio\Home Speakers & Subwoofers". The seller is "techronics-store" and is located in Gardena, California. This item can be shipped to United States.